In the diversity of the plant kingdom, each and every spices has its own wisdom. If we take an open, caring, humble and patient approach, they are there for offering us their best to help, just as human fellows should do when treated the same way. All of them carry the qualities of their own uniqueness, yet, if I had to choose a Wise Chief, I believe sage would take the central seat settled by the fire in the middle of the yurt. 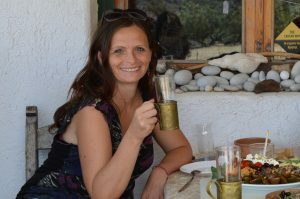 The article was originally written for and published in the issue 2019/1 of Aromatika Magazin, an online publication in Hungary to support holistic living, the practice and professional education of aromatherapy, phytotherapy, naturopathy and related subjects. My special thanks and gratitude goes to Gergely Hollódi, editor-in-chief of this beautifully constructed aromatherapy periodical, for his always encouraging support. Hope you enjoy the English version in this post. The original copy of the electronic magazine in Hungarian is available for download from the website of Aromatika Magazin. Imagine you could make a visit there, when in need to make an important decision. Feeling excited as entering the sacred place, bringing with you the swirl of thoughts running around your head. It only takes a second, and the fragrant smoke gently comes around you to welcome in as you sit. Worries replaced by calmness, and sipping a magical herbal infusion is taking you further in slowing down and relax. You are quietly listening to the Wise whose presence is holding a place of homecoming. You may lose track of time, even spoken words not reaching you constantly. But you find the place, perhaps in yourself, where the Wise Sage gives you clarity and answers arise from the depth of your soul. As life evolves we keep finding ourselves having to make decisions all the time. It is one of our basic ‘activities’. We do this both consciously and unconsciously. Very regularly, an automatic pilot is on duty and in a series of repetitive situations we seemingly don’t make any extra efforts. And oftentimes, we go through sort of a mechanical process we had learnt over time and got well-integrated into our own decision-making toolbox and strategy book. If we want to be reasonable, we follow the common rules of making rational, down to earth choices by gathering information, analyzing it, making comparison, investigate which alternatives look more helpful to us, then at a certain moment we select the one that seems good and go for it. Or not. Sometimes overthinking is killing us softly. Indeed, it might even be better to take a playful road and leave our fortune to fate. Flip a coin, throw a dice are all options. Whatever the case, our rationalising mind is so powerful, that our intuitive part might not get a chance very often. Even worse, it gets bullied. Giving sage a personality, I wish to bring your attention to this matter that feels a bit out of balance. Indeed, Sage is the one that is called upon since ancient times, whose leaves are rolled and dried. Sage is carried by shamans and healers to burn and use the smoke for smudging. A ceremony that could create an incredibly good service for us in the arena of largely increased mental biceps, by loosening up the stress and opening doors to other pathways. In this realm, empirical experience, emotional intelligence, gut instinct, intuition and clear sensing are all equal citizens, and understood as down-to-earth phenomenons, even if they sound witchy to some. When doing my own work, let’s say for choosing the topic for writing, I myself happen to gallop back and forth, balancing between intellect and feelings as if being pushed on to a floating bridge. Not that I would lack any inspiration. Ohh no! Understanding the complexity of things, the dilemma is rather about which aspect should be given more attention or emphasis in a competitive pool of crying subjects. Before starting to sit with my sage writing, for instance, there has been quite some preparations, logical planning and evaluation for various other aromatic plants that I wished to discuss about. And after all, a very unexpected event happened and the subject dropped on my garden table. 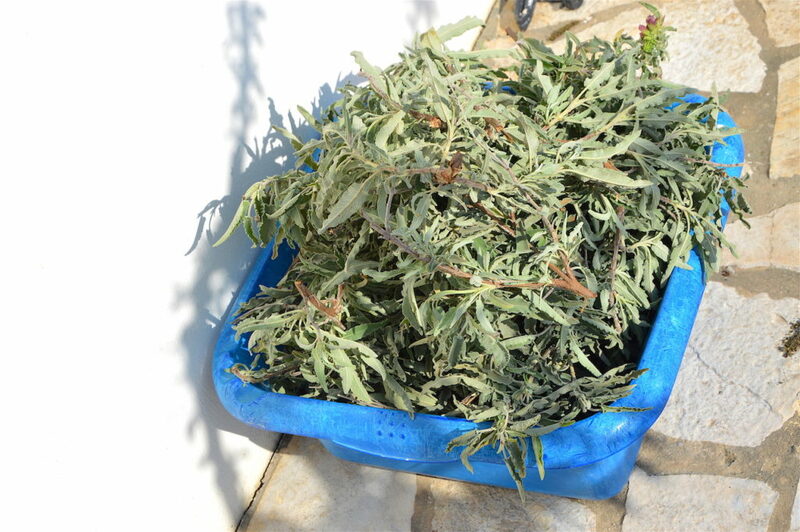 Literally, as a dear friend whom I had not seen for a long while because of some unfortunate circumstances, sneaked in through my garden door and brought a box of beautiful dried sage to me. I was utterly touched. And all this came the day after women’s day, and the day before my name-day, meaning the 9th March. Calling the mystical world of numbers, the Hermit, associated with number 9 immediately jumped out of her skin in pure joy. The one that walks the road alone, accepting that most people seem to not understand her, yet being followed and sought for open-hearted guidance. Nine is associated with universal love, divine perfection, and closing a cycle. Many directions and interpretations, let’s just claim this enough for us now. So I did nothing less, but brought along my collection of sage essential oils from around the world, about ten different bottles, also my hydrolates and alcoholic tinctures that I produced, and decided to make an inspiring aromatic spray to align myself into the sage experience and bringing it to the world. 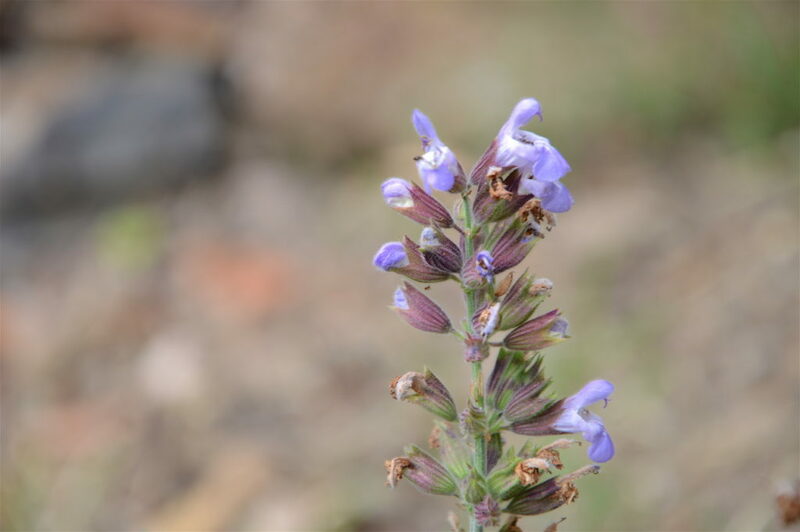 According to Fielding, Turland and Mathew, in their heavy-weight botanical guidebook Flowers of Crete, there are two common sages in Crete: Salvia fruticosa (S. triloba) and Salvia pomifera. 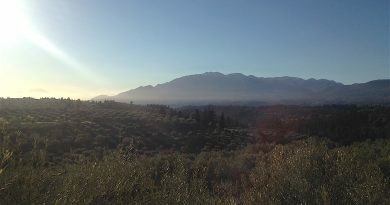 Although they share similar habitats – pine woodland, olive groves, shrubs, garigue and rocky places – but S. pomifera grows mainly on lowland, while S. fruticosa lives rather as a montane plant. Considering the topology of Crete, I believe there is no sharp line between the two, and to the best of my knowledge their flowering period is not limited to spring and early summer either. Salvia fruticosa looks somewhat more thin or should I say delicate, with its flowers smaller, light purple, pink or white. Salvia pomifera is more robust, its flowers are beautiful purplish violet-blue, and its aroma is much more intense. 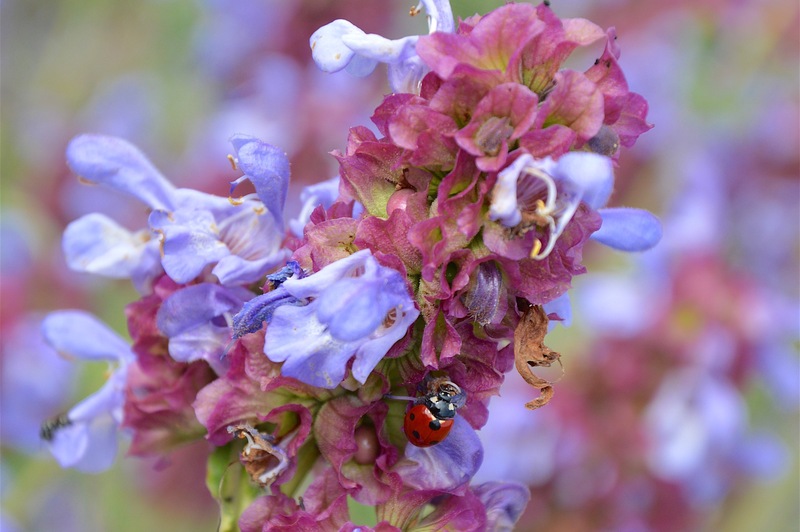 Although both species can be considered as a local variety of common sage (S. officinalis), but their scent is less camphorous and spicy, and much more gentle and floral. 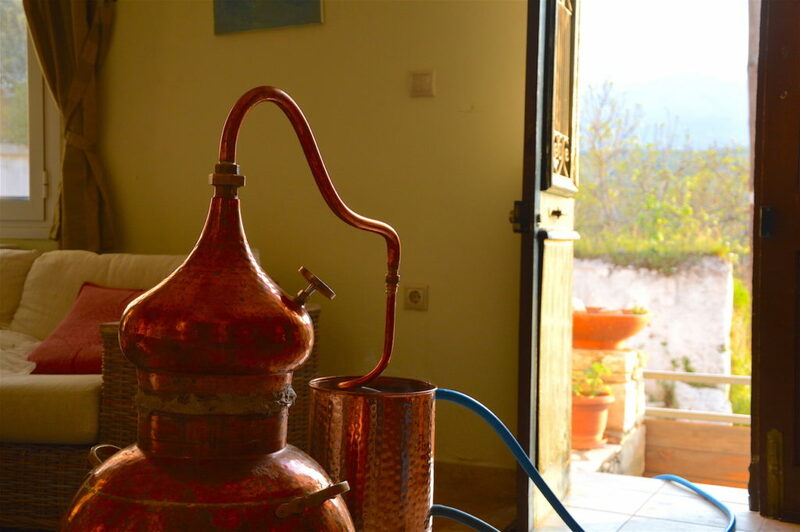 I have worked with both local Cretan sage varieties, but it is Salvia pomifera that gets into my distillation alembic more often than the other. 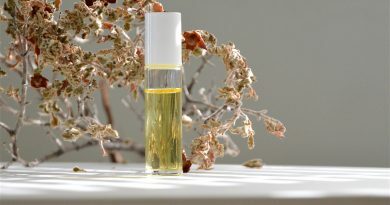 I find that the characteristic notes of the essential oil coming back gently in the scent of the hydrosol, and so, the aromatic distilled water of S. fruticosa is somewhat spicy and slightly sweet. When I look at my Salvia pomifera hydrosols, three different distillations would result three different aromas. One reason is that in spite of short local distances, we can easily sense when plants are coming from various soil and microclimatic sources. 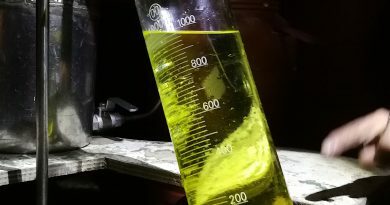 Furthermore, I keep experimenting with both hydro and mixed distillation methods. Not to mention the timing of harvest, and the stage of our flowering plants. 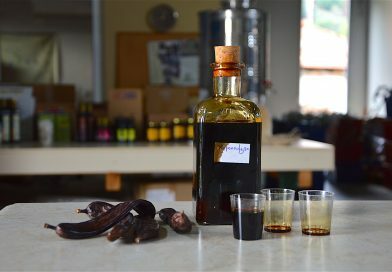 Since my sage distillations have been taking place in the early summer period of Crete, we tend to have a somewhat unique preparation stage. 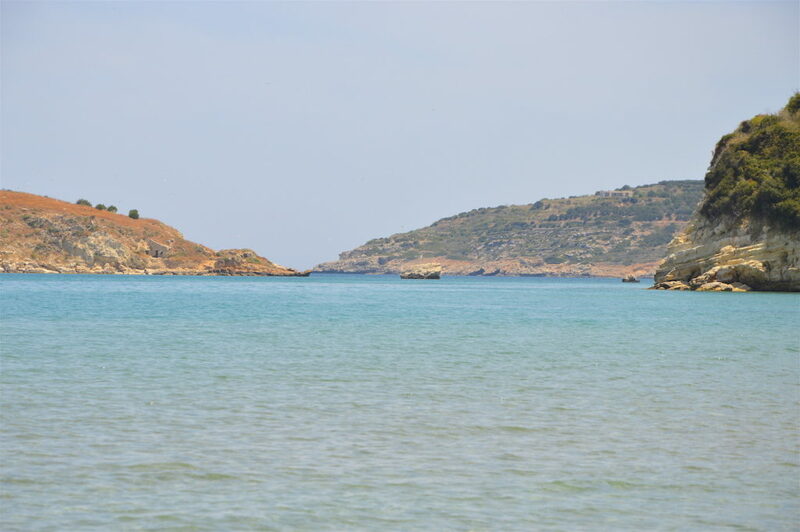 At this time of the year, the water of the Aegean Sea is already pleasant and enjoyable, and somehow we ended up doing a ceremonial cleansing ritual there. After having collected the plants in the morning, we leave them for a while, and prepare ourselves for the upcoming process. There is this special place we go, with a quiet and crystal clear bay where the water often completely still, or brings very gentle waves. We take a dip in the refreshing azure sea. We meditate, we calm down and embrace the traditions of the ancient peoples. We let ourselves deeply into this feeling of the Universe, where each of us have a significance within the world through our existence, our actions and our work. I truly believe that our uniqueness translates into something beautiful and everyone of us have their own character, role, path, purpose and passion. As children, we learn and do everything to form into our individualistic nature as perfectly as possible. As adults, more and more we face with the fact that we actually lost ourselves somewhere along the way. We don’t know who we are, and feel the urge to find back to where we were heading originally. I believe that ceremonies and rituals today are needed more than ever. 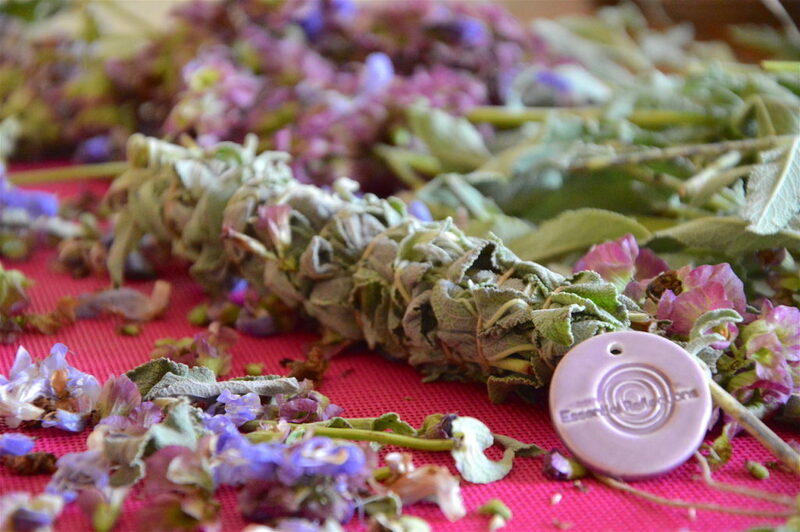 Sage and many other plants can guide us and hold the space, clean the air, salve and illuminate. There could be a solution for every situation, but they have to be thoughtful. If we find ourselves in a crowded metropolitan office workspace, a traditional incense or smudging sage bundle is certainly not the choice. In these all-neutralised city buildings equipped with smoke detectors and such, however, an easy-to-use practical daily routine can be an air freshener spray filled with aromatic hydrolats. And here we go, aromatherapy stepping inside to help work life go better! We are no longer children, but we must keep on learning, other levels and higher purposes. For fine tuning, recognitions, healing and re-alignment. Our former rigorous teachers are replaced by new challenges that come to keep refining our self-knowledge. 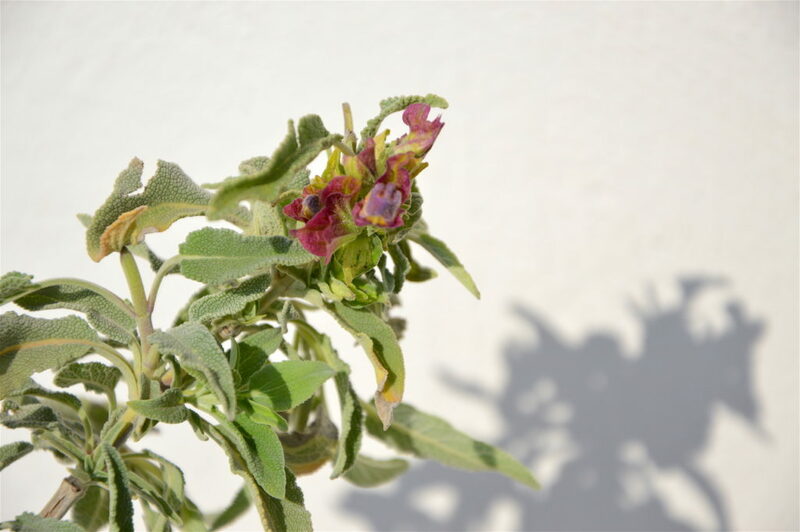 The Cretan varieties are somewhat between common sage and clary sage, and if we remember the keton issue, we can suspect that clary sage gives even more freedom to work with. 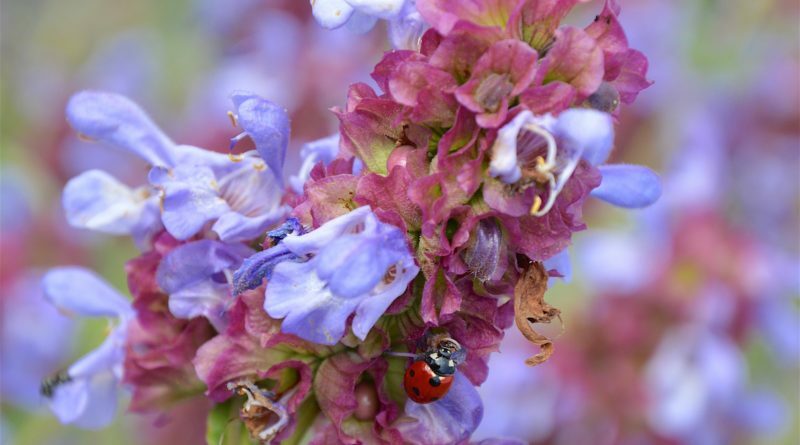 Due to its much more gentle and finely balancing properties, clary sage is one of the most outstanding help with feminine issues, both mentally, physically and energetically. A holistic patron of body and soul to improve the condition of women’s cycles and situations, whether to be for the hormonal system, releasing spasm, or loosening uterine muscle. Soothing tonic at all levels, supporting the nervous system from simple headaches to depressive states. Not easy to sum it up all with a few labels, but the short list might hopefully give a certain introductory overview. The essential oil of clary sage is an old friend of mine, we’ve come a long way together and I’ve been applying it both as a healing herb and as perfume ingredients. Well, I must note that my botanical perfumes as soul medicine. Anyway, clary sage has an interesting floral scent that can show quite different notes depending on its background and origin. I have one reminiscent of apples, and another with some smoky scent, yet to me they all carry something really charmingly witchy. As of now, my distilling of clary sage is yet to be done, but whenever the time comes, I know where to find her. I cannot conclude my sage world without coming out with something that keeps my curiosity piqued. 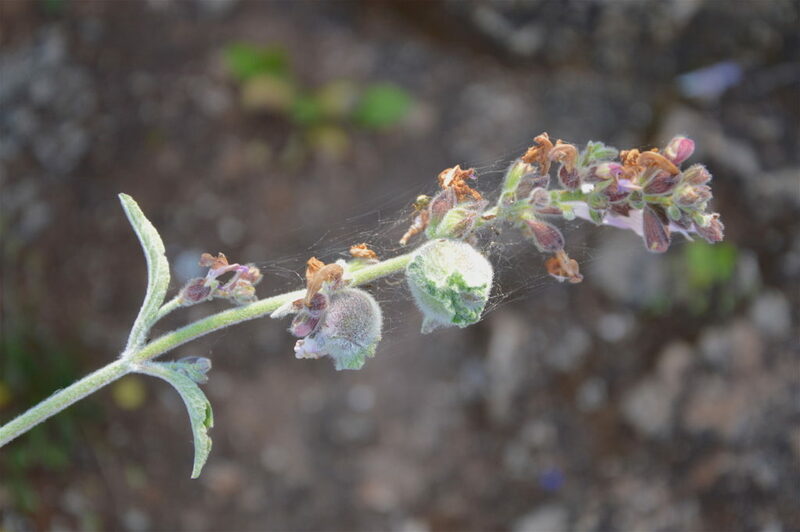 As there is a beautiful plant that is often called fake sage and I am fascinated about it. It has very little literature and that is focussed exclusively on horticulture use. I am mentioning it in the hope that perhaps one day we can see more clearly about the nature of its power. 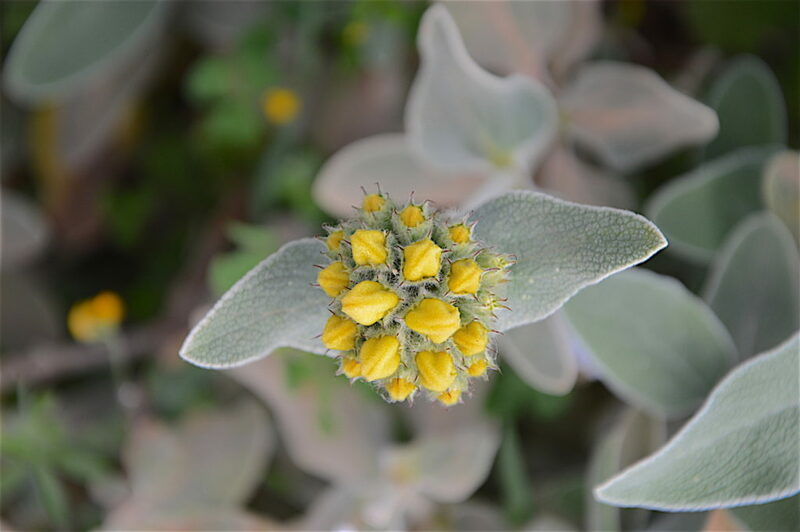 Phlomis fruticosa is called Jerusalem sage, although it is not a sage. It grows all around on Crete and it’s the leaves that are sage-like and because of this one might get confused about it. When it comes to bloom however, the bright yellow flowers beautifully grown in whorls help avoid confusion. Without this, you can also understand the identity as you touch the leaves, yet it would not leave you with the scent of sage that is so easy to recognise. It actually hardy has any odour most of the year. However, I have noticed that there is a certain period of time when it indeed smells very pleasant. Maybe there is someone out there in the world who knows the truth behind the false sage! ?